Season 9 of Real Housewives of Beverly Hills is set to start soon, and the drama is already crazy! Much of that drama involves whether or not Lisa Vanderpump is planning to exit the series after this wild season. Lisa’s co-stars, Kyle Richards, Dorit Kemsley, Lisa Rinna, Teddi Mellencamp Arroyave, and Erika Jayne are mixing it up this time along with newbie Denise Richards. Rumors have been swirling that Lisa would only film with Denise. That is certainly an ominous sign. I don’t think that RHOBH would shine as brightly without OG Lisa. Lisa appeared on Access Live to address the rumors that she will soon be ditching the Housewives. According to Hollywood Life, she said“Well it’s been a really tough season for me. I didn’t do well this season because of many things, but Vanderpump Rules has been great,” Lisa said. When asked if she is considering leaving Real Housewives of Beverly Hills, Lisa exclaimed, “Oh my God. Are you kidding? I think about that every day.” Yikes! Lisa’s brother Mark died suddenly on April 3, 2018, and she struggled to deal with his unexpected death while the RHOBH cameras rolled. “I [also said] that I shouldn’t have come back this year because I was so devastated because of a personal tragedy in my family,” she said. Lisa has been dealing with other show-related drama. There were rumors that former bestie (and splits enthusiast) Kyle engaged in a shouting match with Lisa’s husband, Ken Todd. Reportedly, Kyle banned from their home after the showdown. Wow! That must have been an epic screaming match. Fingers crossed that RHOBH’s cameras were filming! Lisa clapped back during an interview of her own, where she explained that she was working on opening a restaurant at Caesar’s in Las Vegas. “You know what I actually met with Andy before and gave him a cashmere blue blanket and a teddy bear,” Lisa shared. Alluding to her deadline, Lisa added, “I have a job. The same job that I had before I was on Housewives. I didn’t make a career out of being a Housewife.” Boom! Mic drop! 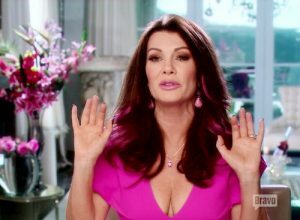 TELL US: DO YOU THINK THAT LISA VANDERPUMP IS GOING TO LEAVE RHOBH? WOULD YOU WATCH RHOBH WITHOUT LISA? DO YOU THINK THAT KYLE AND LISA WILL MEND THEIR FRIENDSHIP?